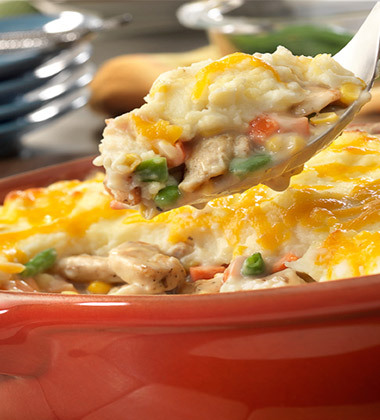 A delicious twist on pot pie - chicken, veggies, Campbells® Condensed Cream of Mushroom Soup and instant mashed potato flakes transform into a mouth-watering dish thats irresistible! 2. Stir Campbells® Condensed Cream of Mushroom Soup and first measure of water together in a large bowl. 2 Season chicken with first measure of black pepper, onion powder, and poultry seasoning. 4. Heat oil in a skillet over medium-high heat. Add chicken and cook until well browned, stirring occasionally. 3 dd cooked chicken and vegetables to the soup mixture and stir to coat. Transfer the chicken mixture into 2-1/2 steam table pans. 4 Heat second measure of water in a stock pot. Add potato flakes and stir until water is absorbed. Stir in milk and second measure of black pepper. 5 Spread potato mixture over chicken mixture in steam table pans. Sprinkle evenly with cheese. 8. Bake for 40 minutes, or until chicken mixture is hot and bubbling. CCP: Heat to 165 °F for at least 15 seconds. CCP: Hold for hot service at 140 °F. 9. To serve: Cut each pan 6 x 4 (24 pieces/pan). Using spatula, portion 1-square onto plate. Serve immediately. 3. Season chicken with first measure of black pepper, onion powder, and poultry seasoning. 5.Add cooked chicken and vegetables to the soup mixture and stir to coat. Transfer the chicken mixture into 2-1/2 steam table pans. 6. Heat second measure of water in a stock pot. Add potato flakes and stir until water is absorbed. Stir in milk and second measure of black pepper. 7. Spread potato mixture over chicken mixture in steam table pans. Sprinkle evenly with cheese. This recipe meets Partnership for a Healthier criteria for overall cafeteria and general menu offerings (a la carte entrees).